The last couple of mornings I’ve been getting up early-ish to write an ebook for Chris. Here’s the provisional cover, which needs some smartening up with Gimp. 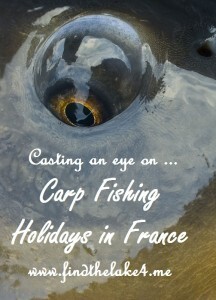 It’ll be available from Chris’s carp fishing holiday directory at www.findthelake4.me in the next few days. 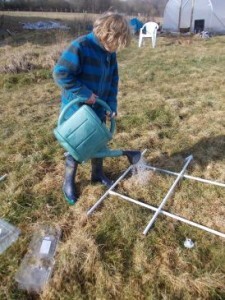 After writing, I went out to do the farm chores and feed the sheep. Yesterday I’d checked No. 27’s teats, since she’s definitely pregnant, and saw that they were getting nice and big. There were a few more promising signs today so our first lamb or lambs (ewes don’t always have twins the first time they give birth) might not be far away. That’s very exciting! Our ram, who’s now known as Rameses, has recently developed a love of having his chin tickled. He’d be happy for you to do it all day. So sheep duties take quite a while at the moment. Then I decided to shovel poo, you know the way you do! Well, we do anyway. More correctly, it was compost. But it used to be poo. I’m working on the second raised bed at the moment while Chris solders pipes in the gîte. I also emptied out the big kitchen compost bin and found four teaspoons. Chris found four in it the other day. I wondered where all my spoons were going. I’m not quite sure how they all ended up in there, I have to confess. The sun was shining and it was cosily warm in the polytunnel so I planted some beetroot and radishes in the raised beds, and started some rocket, tomatoes and lettuces in seed trays. Then Rors and I attempted to do a worm survey. We followed the instructions. We marked out our area and watered it with a dilute mustard mixture, but absolutely nothing happened. I’d expected worms to come popping out of the ground at high speed. Nothing. Now either Creuse worms are just plain tough, or the ground is so waterlogged already that the mustardy water didn’t penetrate. Or that the mustard suspension wasn’t strong enough. I upped the ante and tried again later with some pepper sauce mixed in water. Still no worms. I feel very disappointed since I know they’re there, but how are we going to get them to come out and be counted. I may have to resort to explosives. I did some more shovelling after dinner and then got busy helping Caiti write job application letters and her résumé to send off. She’s probably left it a bit late to get a job with the Tour de France, but we’re trying. We’ve written to some agencies and also to a few of the teams directly. It’s rather nice that we were able to mention to each one that we’d been cheering them on yesterday at Aigurande. Which we had – we cheered for everyone! Caiti has offered to do anything from admin to washing socks. I hope she’ll find something. She’d love it since she’s a really keen cyclist and she’ll been a great little worker. I’d just proofread Caiti’s letter and inserted a very necessary ‘with’ in the phrase ‘I hoped I might be able to work with your team during this year’s tour’, when Rors came in to tell me he’d seen a horse and cart go by (our neighbours a few kms away) and also that he’d found some frogspawn. I went to see that with him. I’d be worried about the frogs and toads this year. Their first batches of spawn got frozen solid during le grand froid. 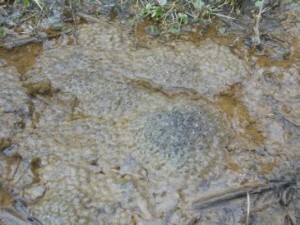 Luckily they’re having another go so they’ll soon be zillions of tiny frogs and toads appearing everywhere.